The past few weeks went by in a whirlwind. I thought and did nothing else but bake. I am delirious (no not from the rum) to have done so much in such little time, but also as tired as my oven is . Cookies, cakes and more cakes have been my routine. Birthdays followed one after the other; the holiday parties and the activities overlapped and our kitchen was warm, fragrant and messy. With so much going on, I did not think I would be able to take any photographs or post this recipe. But it would be such a shame if I did not, for it was one of the best cakes ever. I did manage a few shots, though none of the sliced cake(s). It was A’s birthday and as I sat wondering if we should just order a cake from our favorite bakery, or make his all time favorite Pineapple Cream Layer Cake. A few minutes later he announced that he will have to take dessert for his holiday party at work. First we started thinking of a rum cake, but the golden rum cake did not quite feel right. 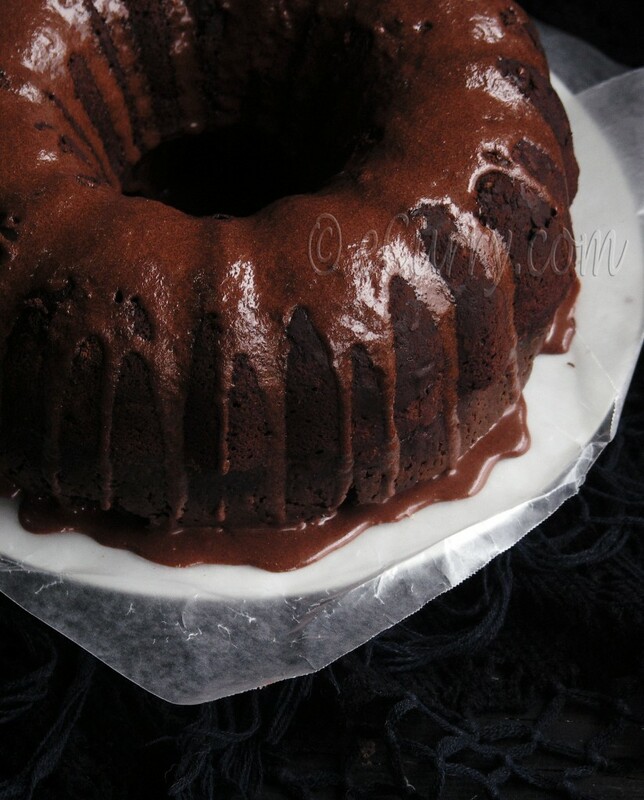 Then I decided to bake a chocolate rum cake as I had my eyes on Jamie’s Bundt Cake recipe. He stepped in and asked if I could do a Mocha Rum Cake. Coffee, dark chocolate and dark rum it had to be. We do dream of delicious elaborately elegant tastes, but that does not necessarily mean that I can easily achieve them. Stepping into new territories when it comes to baking still intimidates me. When I do not have a specific recipe to follow, it gets even worse. I decided to do a trial run with this cake for his birthday. Then I had to bake a few more later if this one turned out fine. I combined Jamie’s recipe with the idea of a the Coffee Flavored Chocolate Cake I had baked earlier. I also added a whole lot of dark rum and drizzled some more after it was baked. Coming back to the Rum Cake – I have no regrets even if I forgot some ingredients from Jamie’s recipe during this baking marathon. It just worked out fine; perhaps not a very fancy looking cake, but dark, elusive, handsome and addictive. I should have known that nothing can go wrong with the trio together. I did different glaze/frosting with each of the cakes, keeping the base exactly the same. One had a light rum and sugar glaze with a sprinkle of granulated sugar on it. I did a rum and chocolate light drip on the the others which I have in the recipe below. One of the cakes was baked using brandy instead of rum, and that was wonderful too! So if you are trying this out, go ahead and use your favorite liquor. If you are using the zest, rub it in the flour with your finger tips. Whisk salt, flour and baking soda. Preheat oven to 300F. 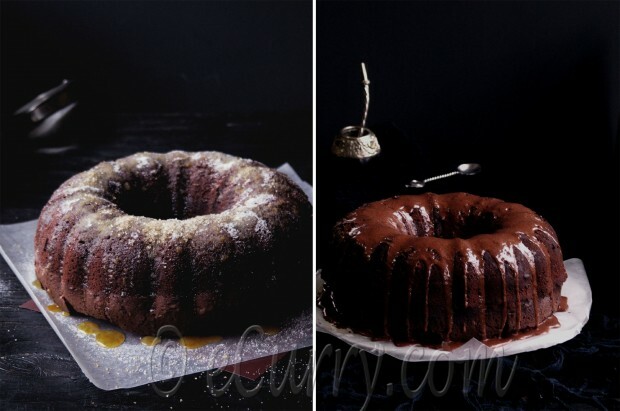 Grease a bundt pan (make sure it is 12 cups or bigger) with melted butter and dust it with flour or cocoa powder(Preferred, as this does not make a cake with white spots once done). Brew the coffee and cool it down. Combine the cocoa powder with the brewed coffee until the mix is smooth. Melt butter and broken chocolate in a double boiler (in a pan over hot boiling water). When completely melted, remove from heat and add the brewed coffee with cocoa powder and the 3/4 cup rum. Combine well. Add the sugar and whisk until everything is combined and smooth. Whisk in about 1/3 cup of flour at a time into this liquid, until all the flour mix has been incorporated. Whisk in one egg at a time, and the vanilla/or orange/or almond extract until it forms a smooth mix. It was be quite a runny batter. Pour batter in the greased and floured cake pan and bake for 1 hr 40 minutes, or until the stick comes out clean and the cake bounces back. Cool completely in the bundt pan. When completely cooled, turn it over on a plate or tray, you will serve in or a parchment paper which can be transferred to a serving plate. Poke holes in the cooled cake with a fork. 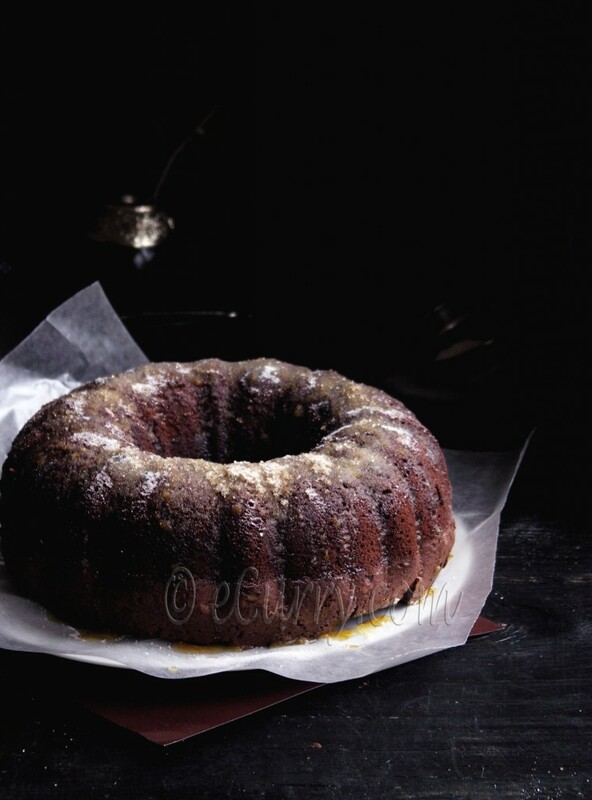 Drizzle the 1/3 cup of rum slowly in the cake, cover it well and allow it to sit overnight in the refrigerator. To make the icing/a light drip: Combine all the ingredients mentioned for the icing/drip and whisk until well combined and there are no lumps of the sugar and cocoa powder. Slowly spoon over the cake, a little at a time. Cover and refrigerate the cake. If you want to do a light rum glaze, whisk confectioners sugar with some rum until it is only a little bit more runny than a paste and drizzle it over the cake. Sprinkle granulated sugar over it. Cover and refrigerate the cake. Mmmmm… looks absolutely divine. 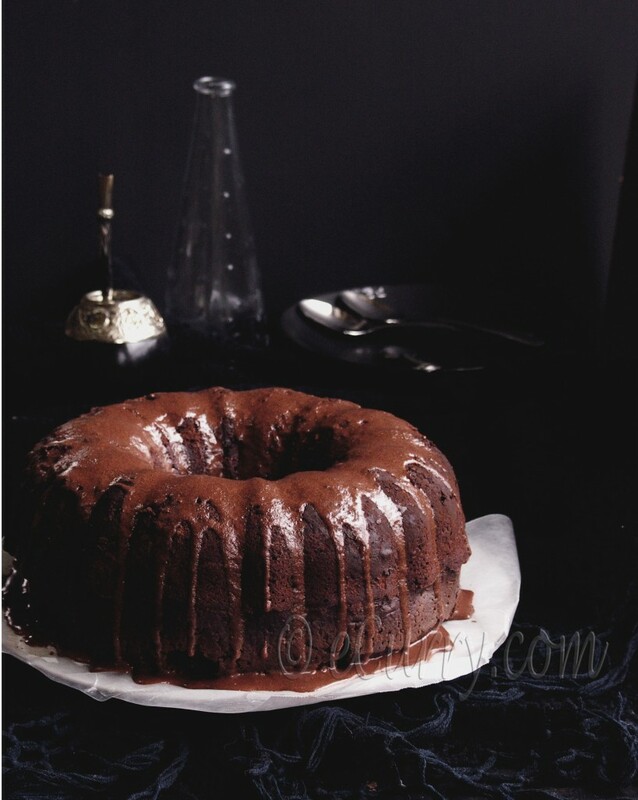 I love bundt cakes.. Lovely clicks Soma! I can never have enough of the mocha chocolate combo! rum is like icing on the cake 😉 literally! A fabulous cake! That is one exquisite flavor combination. Mmmm it looks so beautiful and I do think I deserve at least one slice! But I love the espresso touch you added and so much so that it is now my turn to make your version! Absolutely divine!!! That is one decadant looking cake! Soma, both the versions of the cake is delicious. 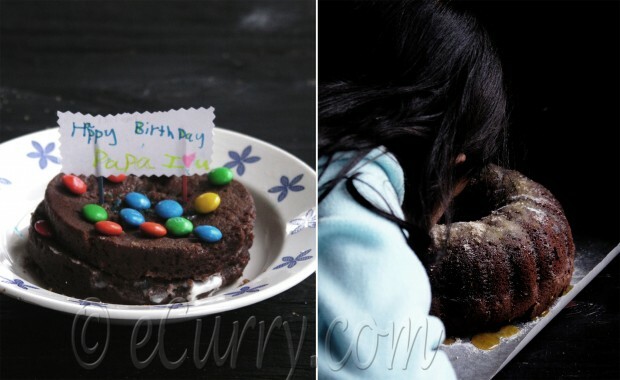 But I loved the microwave cake made by the little one. So cute! Loving this!! Beautiful photo, lady! LOVE the styling! But I know I’ll love the cake even more!! Gorgeous photographs, Soma. Hi , tried ur cake today with minute changes and it tasted better than store boght ! absolutely keeper recipe…I reduced the amount of butter and added one pureed orange . Ur blog is very nice …keep writing . this cake looks beautiful.. i loveeeeeee rum, and i’ve tried raisin rum cakes and fruit rum cakes in the past, never had a mocha rum cake. looks awesome. bookmarking. Looks incredibly indulgent! Thank you for the sharing the recipe with us! The only things I did different were to substitute the butter for vegetable oil and spilt the batter in 2 cake tins .. The cake turned out absolutely fantastic.. The rum was spot on.. The coffee only served to enhance and intensify the chocolate.. And I didn’t feel the need to add the 1/3 cuP of rum post baking…it was super moist and very easy to work with and shape, after a while in the refrigerator.. This was one perfect cake.. And it was a real hit at the party..! (for more reasons than one!).. I wouldn’t change anything.. This one’s definitely a keeper.. Will make again and again… And again!!!:).. Wow, I made this cake for my boyfriend’s birthday and we both agreed that it was the most amazing cake either of us has ever had. Seriously. BEST CAKE EVER. Thank you soo much for the recipe, it is magic.